Length: 6 - 8mm. Background colour: red. Pattern colour: black spots, central spots comparatively large and foremost spots comparatively small. Number of spots: 5-11 (7). Spot fusions: rare. Melanic (black) forms: no. Pronotum: black with anterior-lateral white marks. Leg colour: black. 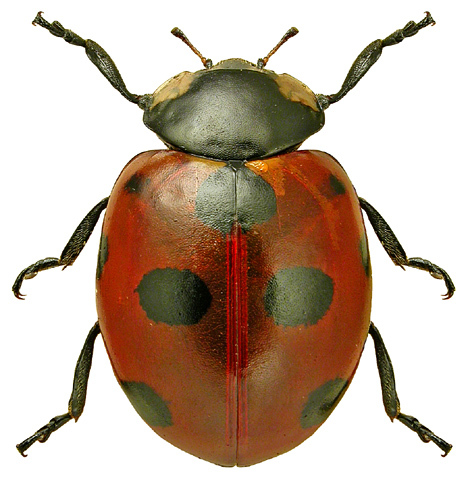 Other features: can be distinguished from the 7-spot by more domed shape and presence of small white triangular marks on the underside, below both the middle and front legs (the 7-spot has such marks only below the middle legs). Fourth-instar larva: dark grey/black; with black tubercles producing fine hairs; pale yellow lateral patches on first thoracic segment; sides of second and third thoracic segments pale grey; middle and outer tubercles on abdominal segments one and four yellow. Pupa: unknown. Habitats: Scarce 7-spot ladybirds are found in habitats close to wood ant nests, usually in woodland but also in heathland. Indeed, this species is always within a few metres of wood ant nests, although never in the nests. Host plants: Scarce 7-spots have been recorded from various plants including gorse, thistles and heather, but are most commonly found on Scots pine. Overwintering sites: Scarce 7-spots overwinter in various locations but always within a few metres of woodant nests. Dieck, C. (2005). 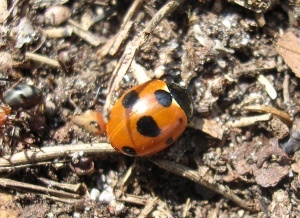 Coccinella magnifica (Redtenbacher) (Coccinellidae) in Dorset. The Coleopterist 14(3): 128.